Manuf. 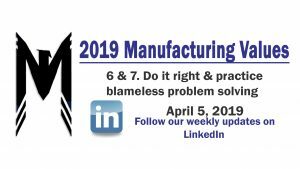 Value 6 & 7 - Personal Responsibility - 2019 - Mohawk Electrical Systems, Inc.
Repost from January 2017 – click here. The title of this value is pretty self-explanatory. Since the projects we take on can inflict injury or death during operation, the priority is to do it right and safely. Every production employee is encourage to double check work on the production line. If employees feel their work needs further checking, the management team is always open to go over the production line to make sure procedures and work instructions were followed. When projects are returned or rejected, it becomes very costly. Following the procedures correctly the first time and double checking the project, helps the projects stay cost effective for the company and most importantly, our customers. In the general sense, mistakes are sometimes inevitable. Whether it be a user-error or machine malfunction, owning mistakes is the only way to learn from them. It is important to solve problems and not blame all user-error problems on everything other than the user. Every mistake is a learning experience; make them learning experiences rather than a blame fest.